Well, there’s a first time for everything, I guess. Normally I don’t do two races in two weekends, but I found out this race wasn’t too far away, and it’s a NYMCRA points race so it should be well attended. I’ve never done Electric City, but ever since I committed to doing it, I’ve had Eddie Grant’s “Electric Avenue” running through my head. To save money, I decided to drive up in the morning. It’s a 3-hour drive, and the race starts at 10, so in order to get there in time to register and prepare, I ended up meeting Jim at a Tim Hortons at 5:45 in the morning. Because my wife is extremely understanding, she came with me to take my car home – the Tim Hortons only has about 5 parking spaces and I’m sure if they’d seen my car taking up one of the spaces all day long they would have towed it. Somewhere along the way, we found ourselves following a van with a racing canoe on the roof rack. Old habits kicked in, and Jim tucked into his wake and followed him no matter how fast he went. About 15-20 miles from our exit, we caught up with Matt Skeels truck – very easy to spot because of the four Epic boats on the roof, including a black V10 GT with a tiny DK rudder. Jim let the canoe guy go and followed Matt instead. Which is great, because neither of us knew exactly where the parking lot was, but Matt did as he’d done it last year. The actual venue was the Lock 9 Park on the Mohawk River. It’s part of the Erie Canal system, and there is dam crossing the river and a lock. It’s a big grassy area, lots of room to park and set up registration awnings and stuff. There’s also an unpaved boat ramp. Obviously, with the dam, there’s only one direction the race could go, upstream (and back). There was a small current but a fairly stiff breeze that was going to be in our faces on the way up. Garmin Connect says it’s a 5 km/hr wind from the north, but it felt more like 20 km/hr and straight down the river. The river bent to the left away from the start and out of sight. We got registered and got our boats prepared, and sized up the competition a bit. Dave Wiltey was there, and I don’t think I’ve seen him since the 2010 Long Lake Long Boat Regatta and he’d beaten me pretty easily there. Then I went to warm up. In between the put-in ramp and the lock, here was a row of low concrete blocks, each with a mooring bollard sticking out of the water. As I warmed up, I followed a C-2 that crossed in between the bollards without incident. But then as I circled around I attempted to cross it myself and discovered that there was another one of these bollards that was completely underwater. I saw the bollard and put on the brakes, and once I thought I was clear of hitting the bollard, I relaxed but hit the concrete platform that was supporting the bollard extremely hard. It made a horrendous noise and I could see white paint on the concrete corner. I was convinced I’d damaged my boat, possibly bad enough that it would fill with water and sink. But there was no time to do anything about it, so I decided I had to put it out of my mind and just concentrate on the race. The race started in three waves – C-1s first, C-2s second, then kayaks and C-4s. I went up to the start line and lined up on the left side of the river so I could be out of the current and out of the wind going around the first bend. Eric and Roger were both there. Jim, Matt, and Royal were a bit further out. I didn’t notice where Dave W lined up. Immediately after the start siren went off, Eric leaped ahead of me. Roger had tried to grab his wake but left enough of a gap for me to slip in. Not long after, a C-4 came up with Dave W on their stern wake. Eric kept pace with them, but due to the way he was positioned, I’m not sure if he was getting any benefit from the wake, but I know I wasn’t – back where I was the wake was more like completely parallel to my boat. And then the C-4 started to pull ahead, so I quickly moved over to Dave’s wake – his wake wasn’t as good a ride as being straight on the C-4’s wake, but it was better than Eric’s because it was moving faster. Eric also saw which way things were going and dropped back onto my wake. Roger tried to get on Eric’s wake, but I don’t think he was successful. Threading the needle between C-2s and C-1s from the first and second waves. Spending way too much time in the middle of the river experiencing the wind and current while crossing, instead of going smartly to the opposite bank. Going through shallows – when this happened, their stern waves would shorten up and I’d have to come up half way beside Dave’s boat so I didn’t end up off of their wake when it got deep again. Somewhere along the way, we lost Eric off our wake. At one point we picked up a C-2, but they didn’t last long. The C-4 didn’t seem to be trying to scrape us off because we weren’t interfering with them, although at one point the C-4 stern paddler turned and said something to Dave about our nice ride. A medium sized power boat had come through in the other direction. Its wake hit us while we were snaking our way through several canoes, and everybody slowed down except me. Even Dave had to brace. Being in a surfski seemed like a distinct advantage, even though the occasional wave would splash into my cockpit and I’d have to open the drain a touch. Nearing the turn, I could see Jim and Matt together. Jim appeared to be riding Matt’s wake – I found out afterward that Jim and Matt decided to just trade off leads as a training exercise. Not far behind them was Royal. He’s getting good very quickly. At the turn, Dave slowed down and tried to take it very tight. The C-4 and I both took a wider route and kept paddling hard. I was just about on the C-4s wake, but when Dave came along to challenge me, I backed off and let him take it. I’m still not sure why I did that. On the way down, the wind, now coming from behind, was kicking up small waves. This seemed to be giving Dave problems – he’d often end up at an angle to the direction of travel and then have to sprint back to the C-4s wake. I think his overstern rudder was letting him down in the small waves. I was thinking it was a distinct possibility that he was going to lose the C-4’s wake and I wanted to be ready to go around him if that happened. But then a very large power boat came through in the other direction. I’d seen what a smaller boat wake had done to both the C-4 and Dave, so I was looking forward to this. This boat made a pretty large wake, and the C-4 turned into it. Dave turned directly into the wake rather than following them, and actually ended up having to brace. I sprinted ahead and grabbed the C-4’s wake. Awesome, now I had the good ride and Dave would have to settle for second best. Except, unfortunately, it didn’t last. Less than 40 seconds after I got on to their wake, they saw a crowd of boats all clustered around somebody who’d been knocked into the water by the power boat wake. I could see that the canoe was already being slid over somebody else’s canoe (a so-called “canoe over canoe rescue” that gets the upside down canoe out of the water and the water out of the canoe) and that one of the C-2s that was in the gaggle was already leaving, so obviously things were under control and I wasn’t needed. I decided to strike off on my own. I glanced back and it appeared that Dave was joining the gaggle, so I thought I was really on my own, but reviewing the backwards-facing camera footage I can see that Dave had second thoughts almost immediately and came right back to my wake. I had no idea Dave was there, and I just was working my way up through the widely separated C-2s. I’d get up to one, take a drink and recover a bit, then blast past them and try to chase the next. Just about the time I got to the bridge where the 3-mile race course turned around, there were two C-2s close together but neither one was riding wakes. I couldn’t tell if one was faster than the other. I caught up to rear one’s stern wake and I was hanging out trying to recover for my next blast up to the next one. I was tiring, and these were getting harder to do. Suddenly I see Dave coming past and onto the wake of the leading C-2. Oh, that’s a surprise and not a nice one. I find myself back in the now familiar place, riding Dave’s stern wake. But the second C-2 either wants the first C-1s stern wake for themselves or they’re not very good at paddling in a straight line because several times they come in close enough to Dave that he has to stop paddling on that side. Each time that happens, Dave slows and I attempt to come through, but I don’t have the energy. But now it’s less than a kilometer to the finish and I can see it straight ahead. Rather than paddle in this variable speed battle for the C-2’s wake, I decided to see if I can get any benefit from the now very strong tail wind and wind driven waves and strike out directly downwind. At first, it appeared to be working, as I ended up even with the C-2 while Dave was still on their stern wake, but then he put the hammer down and came around them and passed me. He ended up finishing 4 seconds ahead of me. Eric was a minute and eight seconds behind me, and Roger was a minute and four seconds behind him. 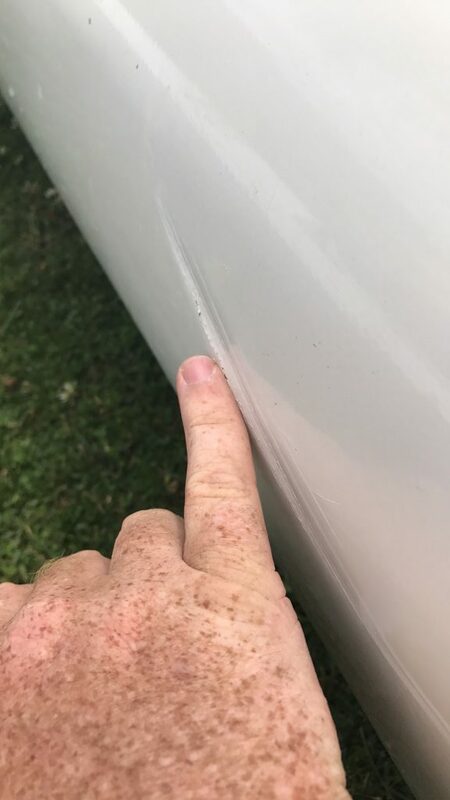 And after the race, obviously, the first thing to do was to get a good look at the damage to my boat from the pre-race bang. And it was bad. Not catastrophic leaking boat bad, but bad enough that cloth is exposed which means no paddling it until I can get it fixed. I hope it doesn’t cost $500 like the last time. The second thing to do was to look to see if the lunch was worth the $5 they were asking for it. It was. Really good value, and really good food. A very well organized race, and a very well organized lunch afterward.